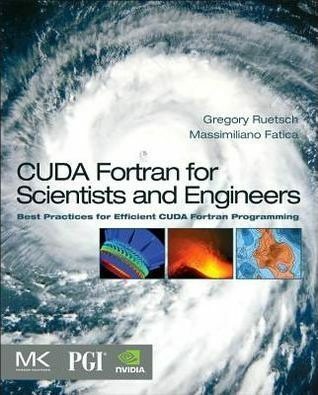 This post is the first in a series on CUDA Fortran, which is the Fortran interface to the CUDA parallel computing platform. If you are familiar with CUDA C, then you are already well on your way to using CUDA Fortran as it is based on the CUDA C runtime API. There are a few differences in how CUDA concepts are expressed using Fortran 90 constructs, but the programming model for both CUDA Fortran and CUDA C is the same. If you are familiar with Fortran but new to CUDA, this series will cover the basic concepts of parallel computing on the CUDA platform. CUDA Fortran is essentially Fortran with a few extensions that allow one to execute subroutines on the GPU by many threads in parallel. Before we jump into CUDA Fortran code, those new to CUDA will benefit from a basic description of the CUDA programming model and some of the terminology used. (Those familiar with CUDA C or another interface to CUDA can jump to the next section). The CUDA programming model is a heterogeneous model in which both the CPU and GPU are used. In CUDA, the host refers to the CPU and its memory, while the device refers to the GPU and its memory. Code running on the host manages the memory on both the host and device, and also launches kernels which are subroutines executed on the device. These kernels are executed by many GPU threads in parallel. Declare and allocate host and device memory. Transfer data from the host to the device. Execute one or more kernels. Transfer results from the device to the host. Keeping this sequence of operations in mind, let’s look at a CUDA Fortran example. The module mathOps above contains the subroutine saxpy, which is the kernel that is performed on the GPU, and the program testSaxpy is the host code. Let’s begin our discussion of this program with the host code. The real arrays x and y are the host arrays, declared in the typical fashion, and the x_d and y_d arrays are device arrays declared with the device variable attribute. As with CUDA C, the host and device in CUDA Fortran have separate memory spaces, both of which are managed from host code. But while CUDA C declares variables that reside in device memory in a conventional manner and uses CUDA-specific routines to allocate data on the GPU and transfer data between the CPU and GPU, CUDA Fortran uses the device variable attribute to indicate which data reside in device memory and uses conventional means to allocate and transfer data. The arrays x_d and y_d could have been declared with the allocatable in addition to the device attribute and allocated with the F90 allocate statement. For cases where the number of elements in the arrays is not evenly divisible by the thread block size, the kernel code must check for out-of-bounds memory accesses. The saxpy kernel is differentiated from host subroutines via the attributes(global) qualifier. In the variable declarations, the device attribute is not needed as it is assumed that in device code all arguments reside on the device. This is the case for the first two arguments of this kernel, which correspond to the device arrays x_d and y_d in host code. However, the last argument, the parameter a, was not transferred to the device in host code. Because Fortran passes arguments by reference rather than value, accessing a host variable from the device would cause an error unless the value variable attribute is used in such cases, which instructs the compiler to pass such arguments by value. Before this index is used to access array elements, its value is checked against the number of elements, obtained from the size() intrinsic, to ensure there are no out-of-bounds memory accesses. This check is required for cases where the number of elements in an array is not evenly divisible by the thread block size, and as a result the number of threads launched by the kernel is larger than the array size. The CUDA Fortran compiler is a part of the PGI compilers which can be downloaded from PGI’s web site, which offers a free 15-day trial license. Through a discussion of a CUDA Fortran implementation of SAXPY, this post explained the basic components of programming CUDA Fortran. Looking back at the full code, there are only a few extensions to Fortran required to “port” a Fortran code to CUDA Fortran: variable and function attributes used to distinguish device from host counterparts, the execution configuration when launching a kernel, and the built-in device variables used to identify and differentiate GPU threads that execute the kernel in parallel. One advantage of having a heterogeneous programming model is that porting an existing code from Fortran to CUDA Fortran can be done incrementally, one kernel at a time. Contrast this to other parallel programming approaches, such as MPI, where porting is an all-or-nothing endeavor. In the next post of this series, we will look at some performance measurements and metrics.